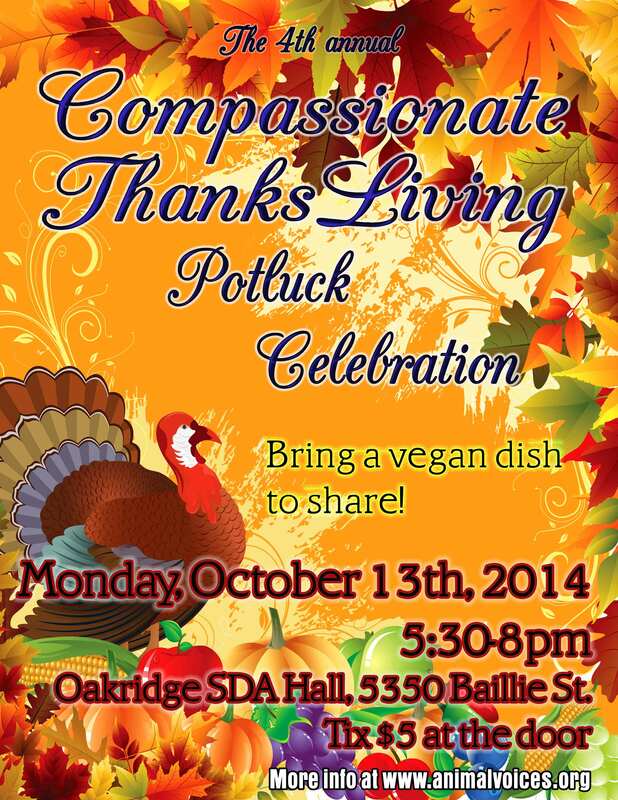 Celebrate a 4th annual vegan Compassionate ThanksLiving Potluck this year by partaking in this feast of thanks and bounty. Build community and share delicious nourishment with like-minded people. Socialize with new and old friends over a selection of live musical entertainment. This is an animal-friendly event, so bring a vegan dish with at least 8 servings (no dairy, eggs, fish, honey, gelatin, whey/casein, or other byproducts). Make sure to bring a plate, cup, and cutlery for yourself, and a serving utensil for your dish (and a bag for your dirty dishes). If you’re not a cook or are pressed for time, no worries! Sharing store-bought food or a non-alcoholic drink (juice, non-dairy milk, coconut water, etc.) is fine. Please bring an ingredients list for your dish, and please let us know if your dish is raw or gluten-free. 210 people attended last year, and we are planning for at least as many this year! It is a family-friendly event, so please bring your loved ones. We will have live musical entertainment throughout the event. Our musical performers will be: Susan Edwards and Hans Krebs playing piano duets, singer and guitarist Sinead Sanders, and singer and guitarist Jenni Rempel! Entry is $5 at the door, and this helps to cover the costs in putting on this event. Proceeds will be donated to the local groups Animal Voices and Liberation BC. Food leftovers will be donated to Food Not Bombs Vancouver. Thank you to the following event sponsors: Animal Voices, Anti-Vivisection Society of BC, Laura-Leah Shaw, Nature’s Path, Me & You Body, V-dog, Gardein, and the Oakridge Seventh Day Adventist Church. To RSVP to this event, visit here and here. However, no rsvp is required – just come! A.U.M Films and First Spark Media, Animal Voices, Association for the Protection of Fur Bearing Animals, Beanfield’s Snacks, Casualty Foods, Choices Markets, Compassion Co., Deb Ozarko, Denise Swanson, Earthsave Canada, Eternal Abundance, Everyday Superfoods, Fairy Cakes, Feed Life, Granola Girl, Graze restaurant, HotHuck’s VeggieFoods, Liz Marshall, Me & You Body, Nice Shoes, Parthenon Supermarket, Tera V Burger, V-dog, Vega, Yvonne Chin, and Zimt Artisan Chocolate.